This practical workshop will provide participants with the skills and knowledge to undertake IV Cannulation in their workplace. Participants will have the opportunity to use the equipment and perform the intravenous cannulation procedure on a cannulation 'model' arm. 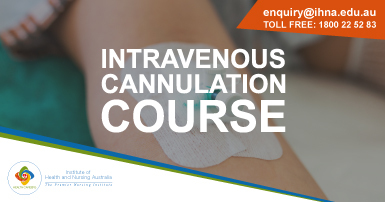 The IV Cannulation course is designed to provide you with an understanding of the steps of Intravenous Cannulation, special considerations and complications and to prepare you for undertaking IV Cannulation competence in their workplace. During the workshop, the participants actually use the equipment and perform the intravenous cannulation procedure. At the completion of the workshop, participants will have their cannulation competency individually assessed on a cannulation 'model' arm. Competency assessment of IV cannulation on model arm. Complete theory and assessments online. You can apply online using the "Apply online" link below. This course does not endorse Health Professionals as competent to do IV Cannulation. The Health Professional will have to complete supervised 5 - 10 IV cannulation tasks in the clinical area as per the organizational requirements. IHNA will not organize clinical placements for the same.